Learn how to drown your opponent. Take him into deep water and wear him out with this passive aggressive fighting style used by great boxers such as Oscar De La Hoya, Kostya Tszyu, Thomas Hearns, and Vitali Klitschko. When I “drown my opponents”, I’m talking about a passive aggressive fighting style I’ve learned over the years. It’s aggressive because you’re constantly pressuring your opponents by following them around the ring. It’s passive because you’re still waiting for them to do something before you throw your counter. The “drowning style” is an intermediate-level boxing skill that allows you to wear out your opponents using little energy. The drowning style is effective against a wide variety of opponents and is not that hard to learn. More importantly, it uses skill to overcome physicality. Everyone should learn the drowning style and have it available when the situation arises. How Do You Drown An Opponent? Do you remember splashing helplessly in the deep end of the pool? Perhaps you remember the horrible feeling of fighting against the water with your arms and legs without getting anywhere. No matter how hard you struggled, the water kept holding you down as you became more and more tired. The scariest part about pushing against the water was that there’s nothing solid push back. The water is always pushing you but you can never push the water. Drowning in water is a helpless feeling of exhaustion. 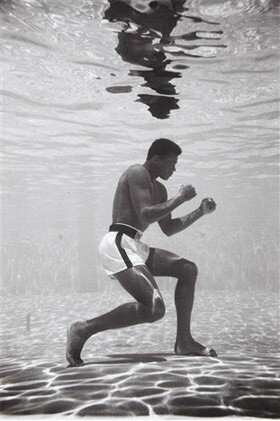 If you want to drown your opponent, you have to become just like that water. You don’t have to hit him hard, you just need to constantly touch at him. You are always putting pressure on your opponent but the moment he pushes back, you move back so that he hits air. Keep attacking him and pushing him but be ready to back up and let him hit air the moment he tries to counter. Hitting air will tire your opponent out quickly. He’ll get desperate and try even harder to come at you but still, you will give him nothing but air. You don’t even block, you just let him miss. The drowning strategy means you will always have the first and last punch. Between your punches is where your opponent attacks but only hits air and tires himself out. The very first thing you want to do is put constant pressure on him. Take away his ground, invade his space, and follow him around the ring but keep your distance! The moment he backs up, immediately take that ground. Remember that you are not Mike Tyson on a murderous rampage! (Drowning is a slow painful death.) Creep cautiously towards your opponent as you settle into range. Leave that jabbing arm out a little so you can attack immediately with long jabs. Come forward with long punches. They don’t need to be especially hard. If you can’t hit his face, keep pushing his shoulder or pawing his glove. You can also throw light punches at his guard. Aim some punches at his chest and push him when he blocks. Keep touching him and you’ll make him feel uncomfortable. Stay at the perfect distance where your opponents won’t reach you but you can still reach them with a quick counter. If you stand too close, you’ll get hit by their punches. If you stand too far, they won’t be tempted to punch. It takes skill to stay right on the edge-of-range at all times. Being taller or longer makes this easier. This is going to sound crazy but yes, you will have to open your guard. is not giving him anything solid to hit. Now don’t drop your hands or throw away your defense! Keep your hands up! When your opponent punches, just split your guard open so their punch hits only air. If they aim for the body, then you just have to lift your arms up. When I split my hands apart, I prepare to throw my overhand right and overhand left hook. Don’t drop your hands when you split your guard. This will slow down your counters and their punches could land on top of you. You want to stay on top of your opponent. When you open guard, you may want to lift your hands up so your counter-punches can throw over the top. I would also recommend slipping your head down and to your rear side if you’re opening guard at close range..
Again, do NOT block if you can help it. You want your opponent to hit nothing but air. This is what gets them tired and gives you time to counter. Also if they’re hitting air, this means you have more time to counter-punch. Do keep your hands close to your chin in case you do have to block at the last second. 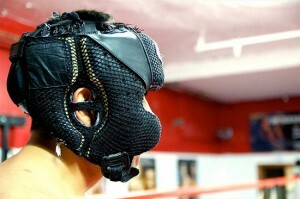 It also helps to move your head slightly when you open your guard. Your head should only be moving SLIGHTLY. You are not slipping the punch. Backing up will also help you trap a guy in the corner. If he’s in the corner, don’t block when he punches because he might pivot to safety afterwards. Instead, take a backstep so you can keep him in front of you and pressure him back into the corner again. You don’t have to land a devastating counter. Anything accurate and stops his momentum will do. If you see him getting sloppy, put a hard shot in. If you already have the upper hand, it may be smarter to keep it a jab fest than to draw him into a brawl. As long as you’re constantly countering and not giving him any room to sneak in, you’re fine. Focus your energy on speed and constant footwork. After you land that counter, start taking his ground again! Don’t let him stand there and get comfortable. Put the pressure on, touch him, punch him, get him to counter at you. When he counters, open guard or back up, and counter him all over again! This is the single most important skill for the drowning style. You need to know exactly what your opponent’s reach is. And move back just enough so that his punch is an inch short. You want to stay as close as possible so that you can move back into range and counter before his guard is up. Don’t move back so much that your opponent isn’t tempted to punch. At the same time, you should also know the EXACT length of your own arm. You should be able to look at a target and know exactly how close you need to be to reach it. A more experienced boxer once gave me a great training tip; he told me, “When you throw straight punches at the heavy bag, position yourself so punches land within the last 3 inches of your fully extended arm reach, and NOT BEFORE!” The tip helped tremendously and it wasn’t long before I was keeping my opponents at the end of my punches. I kept them as far away as possible and did not give them a single inch. One of the best ways to put pressure on your opponent is utilize your full height and reach. If you’re not tall, at least learn how to fight tall. Don’t spread your feet too wide or bend down too low. Be ready to move instead of anchoring your feet into the ground. The drowning style will allow you to win the fight on footwork and less on punching. If you have the better trained footwork, you can step in and out as you chase your opponent down. You don’t need to have super fast feet. You just need to be able to move in and out inches at a time. It isn’t necessary to have explosive footwork to drown an opponent! Push forward slowly, inch backwards quickly, and then go forward again! The footwork is probably the most important and will act as your defense since your front arm isn’t always covering up. The jab is key to keeping your opponent away. Your jab is usually responsible for landing the first and last shot.As long as you’re fighting at a distance, you will need a great jab as your longest weapon. Don’t worry so much about power, focus on speed and accuracy. You also shouldn’t retract your jab arm so much. I like to leave mine extended halfway out so I can jab out immediately if he comes into range. The drowning style is naturally a great style for taller boxers or guys with longer arms. You don’t have to be tall to use the drowning style. As long as you have great control of distance and range, you will be able to drown your opponent. Having a height or reach advantage makes it much easier for you to stay on the edge-of-range, put constant pressure on your opponent, and still be out of his reach. You become a nightmare for any boxer when he realizes he can’t hit you. The drowning style can work well for tall boxers but it doesn’t mean it’s perfect for everyone. If you have great slipping skills or incredible punch endurance, perhaps you want to stay inside more often. It’s going to be a lot easier to hit and move out of the way against these guys. Land the first punch, back up, land the counter. Do it over and over. There’s nothing they can do about it. These guys spend a lot of energy punching. Instead of blocking their punches which only encourages them to punch harder, just let them hit air and let their aggression tire themselves out. These guys love being explosive and closing ground. Because they usually have preset combinations before they jump in, you’ll easily break their rhythm if you make them miss their first punch. Their fast hands make it risky for you to stay inside of range. Stepping back might allow you to see countering opportunities. If you can’t reach their head, just touch their shoulder or paw at them. They especially hate being touched. These guys are easy prey. You can easily push them around if they’re only fighting one punch at a time. All you have to do is avoid that one punch they have loaded up. There will always be the annoying shell type fighters that block forever until they see a counter-punching opportunity. I’m referring to the Arthur Abraham and Joshua Clottey type of fighters. Just keep them on the defensive by stepping back every time they counter. Your constant pressure will keep them from coming out of their shell. Study how Andre Dirrell beat Arthur Abraham to see how the drowning style beats the shell defense. These guys are perfect victims for the drowning style. You don’t want to be too aggressive against them and risk getting caught with a big desperation punch. Moving in and out is going to be easy against their tired legs. Keep in mind that tired opponents typically become potshotters which makes them easier to “drown”. The young De La Hoya terrorized all his opponents with a drowning pressure style. His amateur record was 223 wins (163 KOs), and only 5 LOSSES! He did it with constant footwork and a great jab. The same skills won him titles in 6 different weight classes in pro’s. De La Hoya used his height and great legs to bounce in and out of range as he jabbed his opponents to pieces. He didn’t have to slip punches because he was always out of his opponents’ range. When they moved in, his counter-jab kept them back! Oscar De La Hoya vs Julio Cesar Chavez – Watch ODH jab Chavez to pieces and give up ground with his great legs. Oscar De La Hoya VS Felix Trinidad – Less pressure but great example of fighting at the edge-of-range. Tszyu was a rare specimen possessing both top-level skills and top-level power. Like De La Hoya, he sported an insane amateur record, 259 wins and only 11 losses. In the professional ranks, Tszyu carried knockout power but never felt the need to be careless and try to steamroll his opponents. Instead, he kept them at the edge of his reach and constantly backed up instead of blocking their punches. Watch him fight entire fights with an outstretched left arm, using it to throw pawing jabs or pushing opponents away. Kostya Tszyu vs Robert Rivera – Tszyu chases but backs up quickly. Takes out Rivera in less than a round. He does the same vs Nedrick Simmons. Kostya Tszyu vs Zab Judah – Tszyu pressuring Judah before dropping him 3 times with ONE PUNCH in the 2nd round. Kostya Tszyu vs Forrest Forest (amateurs) – Watch Tszyu swiftly open his guard over and over, it’s very subtle and absolutely PERFECT BOXING! Being a taller guy, it’s not hard to see why the drowning style works so well for him. You might notice that Hearns did not have to move his feet much to get out of the way. He only had to lean his upper body back. Hearns also had very long and skinny arms which could be considered fragile. It’s not a good idea for him to block punches with his arms and risk bruising them. Thomas Hearns vs Sugar Ray Leonard – Hearns pressuring Sugar Ray Leonard from out of range. One of the best drowning-style fighters I have ever seen. Watch this 6’7″ heavyweight monster knockout one opponent after another without taking any damage or wasting energy. Even more incredible is how he fights with his hands down and yet never gets hit! He’s a heavyweight Houdini when it comes to getting out of the way. It’s all footwork! Vitali doesn’t throw many punches yet you see fear in all his opponents’ eyes. It’s his calming stalking presence. Vitali Klitschko vs Kirk Johnson – Vitali chasing Johnson with long punches and quickly backsteps when Johnson fires. Drowning opponents has always been a favorite strategy of mine. It’s a passive aggressive fighting strategy in that it puts pressure on your opponents without you being aggressive. It doesn’t require a lot of punches or a lot of power. As long as you keep yourself from being touched, you won’t have to spend much energy blocking, punching, and pushing back at your opponent. It’s just your constant pressure and yet always being out of the way when they punch. It’s like you’re always there but also not there. Your opponent will get annoyed when you keep disappearing everytime they throw a counter. The drowning style is psychologically and physically effective! Once you get the hang of range control, you can move up to the next level boxing skill which is staying in range and using angles to attack & defend. But that’s a different boxing guide for a different day. Until then, go have fun drowning people! What’s the best way to absorb a body shot? Im a good amateur boxer from nigeria, im so fund of reading your articles but the problem im having is: when i put down everything i red into training it seems so effective but when ever i meet a southpaw i became more confused, so this this drowning style, how effective is it most especially to a southpaw? Or must there be a different way to use it on a southpaw? Thanks in anticipation. @Nwankwo christian – the drowning style will definitely work against a southpaw. You can see Kostya Tszyu use it against Zab Judah in the example link above. Against a southpaw, you may have to move a bit more and have to keep moving your head up and down. some of the links to the fights dont work!!! and when is the article on how to beat a shorter fighter coming??? @f – thanks for letting me know! I fixed the links just now. The guide to beating shorter fighters is on its way!!! Another great guide. I know you haven’t put the different stances article up yet, but can you do that because I wanted to know if There was a way to get extra reach out of your stance and surprise people that have a reach advantage over you. Also can you do an article on improving and learning range control (your sense of distance, the edge of range, and how to know the optimal distance for each kind of punch)? Thanks in advance. Btw, when is a James Toney and Bernard Hopkins article coming out? How do you counter this style? I am just beginner boxer, my weight 75 kg height 187 cm, everybody said use your reach keep a distance, but still something was missing. I was looking for my own style. Then i read this article i found what i was looking… Big thanks to you mate, your articles GREAT, learned lots from you. @K – The stance article is going to be a while longer. While everyone knows of 3 or 4 main styles in boxing, I can’t help but notice at least 10. There are so many styles and combinations of styles that one article couldn’t hold all the words I would express on the subject. Either way, the article is being organized right now but I don’t think it’s anywhere near ready for release. Soon enough. The James Toney and Bernard Hopkins is scheduled for much later but I’m definitely very excited about covering those 2 greats. Countering the drowning style is a game of endurance. Try to walk the guy down and keep invading his ground without getting hit. Get him on the ropes where he has no room to use the open guard tactic. When you punch, use a lot of combination punches and be ready to slip his counter. Drowning style type of fighters sometimes become pot-shotters themselves. @Don – congratulations! Life in the ring always looks better when you keep re-discovering your style. Have fun in there and let us know how you do. Fantastic post as always! I’m consistently impressed with how great your posts are. 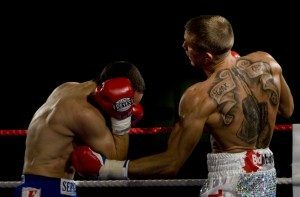 Expertboxing.com is the best site online to learn how to box. Thank you for the support, guys. Thank you all! Now I know how to get the guy to stay still long enough for me to unleash some offense. So now what should be the next steps to get some kind of combination off? 1 or punch combo’s max? I personally love the mid range hooks and uppercuts. How do I get that mid and close range with this offense to utilize my angle/power punches? Lead with the jab when the time is right? @DKL – get him tired and he’ll eventually stay still and wait for you to come to him. can i use this strtegy against guys that r like 6 inches taller than me. ?? i am good and slipping and bobing weaving and also got good footwork. usually i am a volume puncher. adnan – try it out for yourself and let me know how you do! this style can work for anyone. Just started going to a boxing gym about a month ago. I think I’m not seasoned enough to employ this style yet but I’ll definitely keep this in the back of my head as the style to work towards. The videos were a great help illustrating it in action, esp. the Vitali one. I’m tall and a southpaw so I think it’ll do wonders for me. @Keenan & KneadItLikeAPizza – thanks, guys. Update me on how well the tactics work for you!!! is this a good style to employ when u have superior conditioning and stamina than ur opponent? As a shorter guy, I’m dying for your article on staying inside. I can see the shorter guy getting away with the drowning style against newcomers, but would it become obsolete when fighting taller, advance fighters? @TGP – this style is requires a lot of in & out movement, which is drastically multiplied if you’re a shorter guy or have shorter reach. If you have superior conditioning, I suggest you use the energy to cut around the guy and slip his counters. If you insist on jumping in and out, try exiting at a different diagonal angle every time. @Gordon – this style definitely favors the taller or longer armed fighters. I currently have an article in the works of getting inside and will release it soon. There’s so much stuff to be put out! I’m a Firefighter, and fought in a Battle of the Badges recently. I beat a shorter, but much stronger and more experienced opponet using this technique. I can’t thank you enough for this website. I study this site daily to supplement the technique that I learn from the trainers at my gym. Another huge help was the advice on running by sprinting until I was tired and then having to be able to catch my breath while still jogging to simulate hard exchanges and catching your breath while still punching. Again keep up the great work Johnny! by the way still looing forword to your guide on inside fighting. Out-fighters are definitely not use to missing their opponents. Awesome work, adnan. The inside fighting guide is coming soon enough. I think I may have to break it into several parts. It’s almost a whole new fighting style on its own. Requires more pushing and wrestling (balance manipulation) than fighting at a distance. hey johnny in a lower division who is faster ?? a tall guy or a shorter guy?? say at 13 for example. 1 guy is like 5ft 6 while the other guy is 6 ft. i heard from someone the taller ( skinnier guy is faster.) is it true?? Height isn’t always a clear indicator of speed. It means that when you hit the heavy bag, your arm is almost straight and making contact with the bag within 3 inches of your full arm extension. Did that help, Travis? Johnny, u’re yet to put up d post on staying in range and using angles, but u’ve done so much that i can’t help but feel indebted. I’d appreciate u helping me mail nwankwo christian my email or his, or at least notify him, so we could probably meet and xchange thoughts. I’m glad n surprised @ d fact that other nigerians are thirsty 4 knowledge (i hope i’m not fitting d nerd category) i definitely want to know if d guy is in my state so we can meet. I would like if u sent d reply 2 my box, were it’s easier 4 me to know i’ve been messaged. Thanks twice more johnny. Okei, the angles article is backlogged behind 30 other requests that came before yours. I can only write so much so it’s going to be a longgggg while. Not just that but I’ve got plenty of other stuff people should learn before they can truly move effectively and use those angles. Never the less, stuff will come out as soon as I have time to write. Thanks for waiting (even if you don’t want to). Maybe doesn’t have to always be moving back, but making space so he hits air. Master it! If this style doesn’t work for you, you’ll have to use another style. I’ll be writing more guides in the future. how do you catch-shoot&grab i’ve seen floyd mayweather do it plenty of times to ricky hatton he catches a punch with his glove misdirects it, fires a shot in retalian and then as he springs forward on his front legs he dips his body downwards after throwing the punch to come upwards and tie up his opponents arms. That’s about as how far as my knowlage exstends but could you exstend upon that. i’ve seen floyd mayweather doing all kinds of tricks slipping punches by turning his body in the same direction as the punch is going so even if he gets hit the power of the punch is lessen because his body weight is turning with it not against it. I know im going into perhaps too much detail here but honestly how does he do this so fluantly. i have witnessed southpaws fighting in the pocket where they place their left hand to the right shoulder and the lead right hand exstended outwards. so the shoulder can dip forward to slip punches over the top and glove held next to the face can not just be in a postion to shield the chin but both perry strights and bait hooks so the lead right hand can be brought back into postion to cover up with the hands turned outwards to perry shots down and still hit with considerable power. floyd seams to see that every rose has its thorn some how but what it mean by say this is, is that am i right to think this or am i loosing sight of the bigger piture? Oh yeah not to mentioned that i heard that in the fighting in the pocket with the left glove to the right shoulder – if you opponent chooses to go to the body you can just bring your lead right in close around your stomouch tucked into your elbow in tight – to shoulder roll the punches to simply rotate and turn the torso agilly missing the shot entirly. correct me if im wrong but am i right to think this? is this a back plan created from fighting in the pocket or not.? You’re definitely losing sight of the big picture. Floyd Mayweather can do all those things because he mastered a wide variety of skills in realistic fighting conditions. I would suggest you master the skills taught in my shoulder roll and slipping guides and to spar a lot using them. In time, you’ll discover the answers to all these questions…and MORE IMPORTANTLY, you’ll be able to do it yourself. Does your opponent hav to be threatened by ur punching power and conditioning to be able to drownstyle him? That way hel panick and leave himself open for a KO punch. Whether or not your opponent is afraid of you is less important than whether or not you actually have the power to hurt him. If you can’t hurt your opponent, no style will work. By hurt, I mean having at least enough power to momentarily stun him. The drowning style CAN be effective if it works for you. It will work easier for tall fighters than for short fighters. And it’s ESPECIALLY more effective if your opponents rush in. It’s made to counter that! BUT I wonder how your supposed to dodge the opponents body punches? Do you simply just move out of range?? That’s an option. This style is to be used whenever you can. If you find it ineffective for something like body punches, then you have to try something else. Can I use Hearns vs Benitez as an example of the drowning style??? If you like how it’s done in that fight, please copy it! Neither. They have no business competing against each other. – a basketball player would beat the tennis player at basketball. Suppose the fights were on the street with no rules, then I guess the MMA fighter would win more often. “When you throw straight punches at the heavy bag, position yourself so punches land within the last 3 inches of your fully extended arm reach, and NOT BEFORE!” i dont understand, if i did that wouldnt i miss my opponent by three inches if i adapted to this? It’s a way of visualizing straight punches so that you’re always using your full reach. george foreman had a way of drowning? I’m not sure I remember him for any drowning tactics but pro fighters are definitely aware of these tricks! Hey Johnny, Myself being a 17 year old 6 foot 9 boxer i would really like to master this style. I am mainly looking at Vitali Klitschko and Thomas Hearns to model, but I am wondering about Vitali’s brother Wlad and whether he uses the same thing. I know both of them are outside fighters, but wlad seems to be the more defensive of the two and it seems to me that he uses this exact tactic as well. Also, I notice that Vitali is willing to trade in the mid-range from time to time as well. How does this fit into the drowning strategy? Is it just something completely seperate that he decides to do when he feels like slugging? I have a thin long neck and would prefer to minimize my chances of trading ALA Wlad ( he never gets punched!). Learn to box. All tactics, all methods. Then refine. Do your work. Vitali attacks when he can. It’s that simple. Sometimes he attacks at mid range because it works out perfectly for him. It’s not that he limits himself to a style. It’s that he’s always looking for opportunities which then fits a pattern that can be considered a style. I’ve only been boxing for a few weeks now and the trainer hasn’t even had me spar yet, so using this is still a ways off. But as a lanky welterweight (I am literally the same height and weight as Hearns), I’m going to keep this in the back of my mind for when I do. Thanks for the article and the videos. Great article, I have been trying to work on this because to me it is the easiest thing to do with my cardio, but i am a very low level boxer against mainly low level guys which brought up I question I didn’t see in the article which is parrying. Last time I was working on it I was doing okay against a boxer the same low level as me and was finding myself parrying his jab and either countering from there or stepping out of range for the overhand right. Do you think this is okay even though his punch is touching something (my glove)? Or should I get out of this habit? Yes, parrying is totally fine. Just because I don’t mention other techniques in this article doesn’t mean you can’t add other ideas to the “drowning style”. im going to apply staying on the “edge of range” while im sparring any advice? Use your jab to find your range. Take small steps. Great post this, im just wondering what your thoughts are about this style going up against a non stop aggressive style with good defense, like a tyson, because if you were to step just out of range sometimes people just keeps stepping in and dont care about the shots coming back, therefore taking away the drowners ground and taking him out of the centre of the ring maybe? How would you handle a tyson like style with this? Thanks! I would step up to him to hold the ground and then give up some space when he throws. Or I could throw lots of punches into his guard as I move around him and then after he launches first 1 or 2 shots, I would step in deep and swing some hard shots. I was also wondering about the overhand right suggested as a counter option, would this be a bad choice for a taller boxer since its a bent arm shot therefore kind of taking away your full reach and giving the shorter man a oppourtunity to get his own range? And its just ive never really seen this shot executed while leaning or stepping back, could you perhaps give me an example of a fight in which it is? Thanks again mate! The overhand right can be useful for anyone. If anything, a taller boxer can get away with it more because his arms are long enough that he doesn’t have to get as close to throw one. You’re right in noticing that the overhand right is rarely thrown while leaning or stepping back. It’s because it’s anatomically impossible. The closest thing is to throw an overhand right as you lean to your left. But that’s about it. Yes, this style will work very well in amateur boxing. Would you describe Charley Burley as a drowning-style fighter as well? I think my style is pretty much like his and people always say, I’m a very annoying sparring partner (I take it as a compliment). I feel very comfortable with this style, but my trainer always wants me to put my lead hand up to the chin, which feels unnatural for me. Should I leave my hand down or put it up? final question- what do you think is the right weightclass for me? I’m 6’2 tall and my reach is 6’3. My current weight is 90 kgs, but it would’t be a problem for me to drop down to 80 kgs. Great site, helps me a lot! I think the drowning style is something many pro fighters are comfortable with even if they choose not to use it in every fight. It’s up to you to decide what you want to do and why. I can’t recommend this for you without first seeing how you fight. But I imagine listening to your trainer is not a bad idea. The right weight class for you is the one you can cut down to without suffering from performance issues. Great article, it’s given me loads of ideas to try when I’m sparring next. I actually train in Muay Thai so some of the variables are a little different, but I am assuming the principles are broadly the same. I’m 6’3 and 178lbs but at my club I am one of the lightest and least powerful boxers. To combat this I work hard on accuracy, footwork and my bobbing/weaving and I’m looking forward to adding these range control strategies. Everyone I spar is more powerful than me and I can totally see the benefit of making them hit air rather than smashing through my guard, which happens a lot. My only question is what do you do when sparring a generally more compete fighter? One of my regular partners is my height and range but is about 30lbs heavier and hits like a sledgehammer, but is very fast and dynamic. Would you still attempt this style of fighting? I would recommend this style whenever it works. If it doesn’t work, then you have to do something else. For sure it’s still very effective if you don’t want to take any punches but strategy alone will not make up for lack of skill. You need to hold an advantage somewhere if you expect to win. If he’s bigger, stronger AND more skilled…I don’t see how that’s a fair fight at all. You could do everything right and still lose. Im taking notes of this! I don’t think it’s his strategy that’s beating you, he seems to be a superior fighter to you in every way. Start improving your conditioning and work on ALL your skills…and then go ahead and pit your strategy against him…I think you’d have a different result. Johnny – I’ve been reading your site for the past couple of months in preparation for my first fight. Can I just say; what an awesome resource! It is so comprehensive and well written. The hundreds (thousands?) of hours work that you must have put in to this site are a fantastic legacy for amateur boxers around the world. Are there more examples you can give for the drowning style to watch? Especially fights of short guys applying this style successfully against taller opponents! I really like the philosophy of this style, and seems like this passive-aggressive style would suit me being a tall fighter for my weight class. As a southpaw I was just wondering what the pro’s and con’s would be of using this style against an orthodox fighter. In your opinion do you think a tall southpaw will have an easier time using this? Just curious on how the dynamics would change, and if u have any tips. This style can work for any fighter if it fits the way your body moves and how you strategize things in your head. I imagine being a tall southpaw would make this style easier for you than being a short orthodox fighter. Check out my boxing guides for southpaws.